This is an email I sent to the CDC. Can’t wait to hear how they respond! I am wondering why the Lyme disease case definition from 1994 or prior is unavailable on the CDC website. I only see versions from 2011, 2008, 1996, and 1995. However, my understanding is that some changes were made at the Dearborn conference in 1994. Would you please send me the case definition from prior to January 1994? 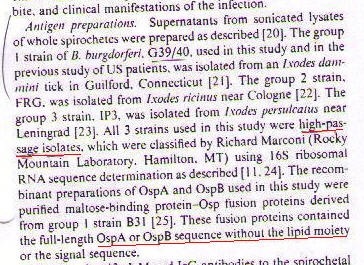 Additionally, I am curious why your website asserts that “Encephalomyelitis must be confirmed by demonstration of antibody production against Borrelia burgdorferi in the cerebrospinal fluid (CSF), evidenced by a higher titer of antibody in CSF than in serum.” This doesn’t seem to square with Allen Steere’s research in Europe, where he used high-passage strains with no lipids attached (unlikely to produce antibodies). Why would one need to produce abundant antibodies for a test that won’t detect them? Also, it seems that according to U.S. patent no. 6,719,983 (owned by Alan Barbour and others), that the ability of borrelia to change the expression of their outer surface proteins enables them to “overwhelm” the host’s immune system. I’m just a lay person, but doesn’t that mean that an antibody response may not be produced? This report in the Journal of Biological Chemistry, “Toll-like Receptor 2 Functions as a Pattern Recognition Receptor for Diverse Bacterial Products” http://m.jbc.org/content/274/47/33419.full.pdf seems to say that borrelia behave more like mycoplasma, or fungal-type antigens than typical bacteria, even potentially causing a “wasting” disease, like that produced by HIV. That sounds pretty scary. Putting all of this information together, a person might start to think that Lyme disease is really the opposite of an autoimmune disease, and really more like a disease of immune suppression. Are there any plans in the near future to adjust the case definition to reflect these seemingly important observations? Go get them! Look up the background of the Board of Directors and Chief Officers of Monsanto who used to work for the CDC and now own companies that make artificial knees (Stryker Corp.), lung tumor meds, and m-RNA manufacturing companies. Wouldn’t surprise me if they bred the Amygdalin our of all their seed products.